Description: The ginkgo grows at least 80 ft (24 m) tall, upright when young and eventually spreading to 30 ft (9 m) or more. Deciduous, the 4 in (10 cm) long, matt green, fan-shaped leaves turn golden yellow in fall (autumn). A fleshy, plum-like orange-brown fruit with an edible kernel appears in late summer and fall if male and female trees are grown together. Uses: Widely used in Chinese and Japanese herbal medicine. Also widely available as an herbal supplement in the US. The main effects of Ginkgo extract are reported to be in the areas of improved blood flow to tissues and organs, as an anti-oxidant it protects against cell damage from free-radicals, and blocks many of the effects of PAF (platelet aggregation / blood clotting) that have been related to various cardiovascular, renal and respiratory disorders. 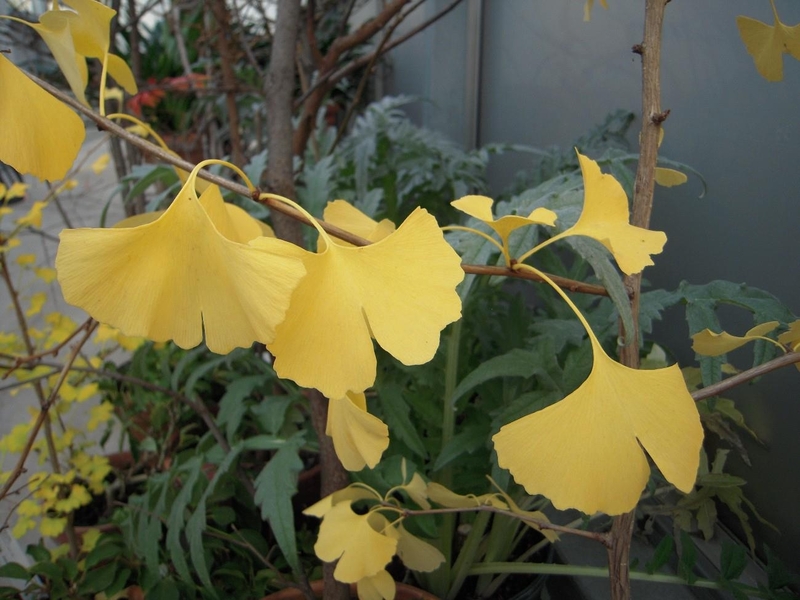 Ginkgo leaves originally grow in China from common maidenhair trees. This leaves can be made into tinctures, teas, powered tablets and more. In the circulatory system, it improves blood flow and strengthens blood vessels. Because it improves circulation, oxygen to the brain increases and is known to strength memory and cognitive thinking. Ginkgo is also anti-inflammatory and treats thrombosis, varicose veins, spontaneous bruising and cramps. This is especially helpful in the elderly. 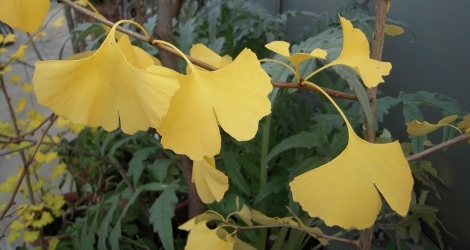 Gingko can be helpful in relaxing the lungs and therefore aides in asthma symptoms. In the nervous system: strengthens brain, cognitive functions, enhances memory, helps with ADHD, neurosis, narcolepsy, helps with Alzheimer's Disease and Addison's Disease, anti-depressant and alleviates anxiety. May also help with strokes and other neurological disorders. This plant is considered a complete brain tonic. seed from Washinomiya Shrine, Saitama, Japan. 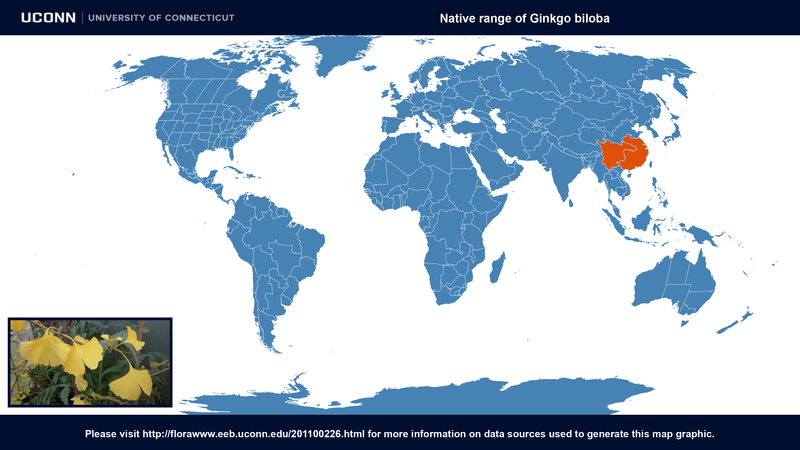 Ginkgo biloba at IUCN Redlist. Last accessed 26 June 2017. WCSP (2016). 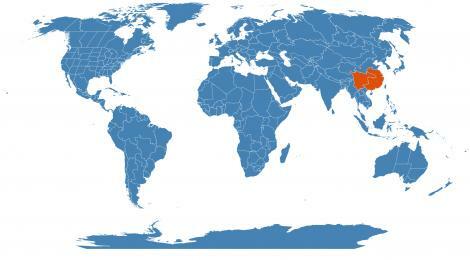 World Checklist of Selected Plant Families. Facilitated by the Royal Botanic Gardens, Kew. Last accessed on Friday, June 30, 2017.